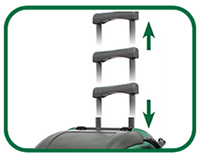 plastic-grip towing handle can be raised or lowered for easy storage. 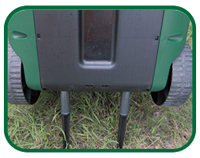 To screw 2 spikes to the holes under towing tube to ensure stability in the lawn by pressing down the towing handle with spikes into the earth. 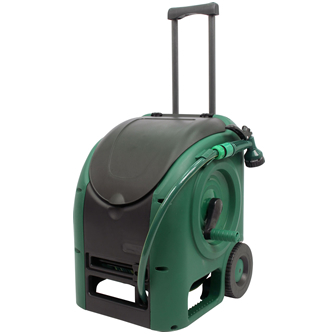 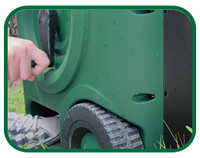 Molded hook for easy hand spray storage with no harm to the hose & hand spray when towing the hose cart. 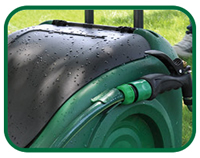 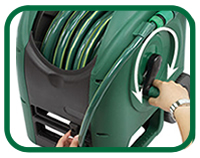 Open the cart cover to see hose placement by moving the manual hose layer knob when rewinding the hose in. 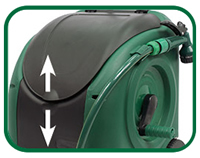 Foot-step hole to help cart stability when re-winding the hose.